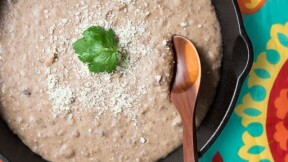 Use any type of bean to make this flavorful, yet simple Mexican dish. Put a colander over a bowl, and drain the beans, saving the liquid for later. Put the lard in a skillet over medium heat, and fry the onions until tender and just starting to brown around the edges. Add the drained beans and fry while mashing with a fork or potato masher. Keep mashing and frying until the beans form a thick paste and start to brown. Add in the liquid from the beans until the refried beans are the consistency you want them to be (i.e. more liquid = more runny). If you want a smoother texture, you can use an immersion blender to puree the beans. Serve with a sprinkling of crumbled Cotija cheese and hot sauce.